Communications with conscience was top of mind when delegates from 66 countries gathered in Madrid for the World Public Relations Forum. 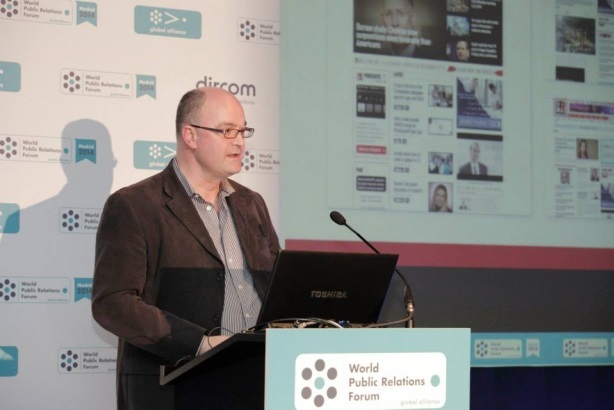 Steve Barrett speaks at the World Public Relations Forum in Madrid. Good Business, Better Business was the theme of PRWeek’s conference in New York last week and Communications With Conscience was also top of mind this week when 800 delegates from 66 countries gathered in Madrid for the World Public Relations Forum 2014. PR professionals from all around the world met to discuss the importance of the communications function within organizations, the value of conducting business with a social conscience, and the impact of the changing media landscape on comms practitioners. "I see a crisis of confidence all around me: in politics, in business, in sport. The result is a fracturing of trust between those who lead and those who are led. A lack of leadership is at the heart of many issues concerning people today. "PR can be an agent of change. Communications is leadership – it guides our hopes and is responsible for some of our disappointments. But we must stop obsessing about the tools of our trade and start obsessing about purpose." "Society is becoming a more important stakeholder. Individuals in society must have a strong capacity to communicate. The main role for [brands and companies] now is to be a facilitator of the communications process, not the sole focus." "If we’re serious about addressing the social challenge, [communicators] have to see ourselves as the conscience of organizations in an individual and collective capacity, or we’ll be cruising for a bruising down the line. It’s the moment to shift values and paradigms - purpose is central to all we do." "Don’t be so focused on having a seat at the table – concentrate on having a seat at every table. Communications is the best function to act as the connective tissue in an organization. We can’t cede social listening to marketing, customer relations, or anyone else." "According to an S&P study, the average life expectancy of a company has dropped from 75 years to 15; 20% of a company’s value is now contained in its physical assets, 80% in intellectual capital and reputation. That’s why communications with a conscience matters. But too many C-suite execs still think communications is about spin and marketing." "Young people are very cynical, so stories have to be co-generated, especially when they are related to CSR." "Doing good is taking the joy out of consumerism. We need to change the conversation around CSR to make doing good fun and fashionable." "Packaging news and presenting it is one of the great challenges for media. Journalism will be more open-ended and open-minded. I am optimistic about the reinvention of journalism. Journalism will be increasingly open-sourced, but journalism needs to be on watch to ensure democracy." "Journalism needs to be an instrument of democracy. Without it, how can we hold our leaders accountable?" "Information on its own is a weak motivator – the source of the info is extra important." "The collaborative economy is changing the face of business (including media) and communications has never been as important, but it has to change in a radical way. It has to move from a top-down message to empower citizens to share and tell their own stories – you don’t control the message anymore." "The traditional agency of record is a thing of the past." "Communications is vital in corporate reporting: How you influence that business and contribute to its value creation. There is increasingly less isolation between the functions of a business. "A recent Interbrand report showed that 48% of the market value of Coca-Cola could be accounted for in its brand. Intangibles such as reputation, patents, and brands are increasingly accounting for the value of a company."